How to Overcome Writer's Block : A Simple Trick Nobody Will Tell You! Personally tried and tested tricks to overcome writer's block once and for all. No, it’s not the end of your writing career. Neither your passion nor your magic has vanished. Writer’s Block is just a phase. Being a writer myself, I know the feeling of being trapped in the writer’s block. It feels as if Picasso doesn’t recognize his brush anymore. As if my eyes are seeing the blank sheet for the first time and my hands have forgotten to hold the pen. If you ask me what is writer’s block? In simple words, Writer’s block is the inability of a writer to create new works or come up with new ideas to write about. But in my opinion, I would say let’s just rename Writer’s Block as Writer’s Refuelling Period. Why everyone considers it a bad phase? I think this period gives us time to rejuvenate our imaginations. The time when our minds relax and imaginations wander in the Neverlands. But still, we thrive to get back on the writing track. We put in our all efforts to get out of the writer’s block. Even a small change can pave your way to better things. When I hit my Writer’s Block, the first thing I try to do is change my medium of writing. So, if I am writing on Google Docs, I will try my hands on writing with pen and paper. This slight change can naturally help in inflaming the imagination. Try this simple trick and if you didn’t succeed in this then just read further. Most of the times when we struggle through the writer’s block we try to ignore the fact that we are running out of the topics. In that case, writing prompts can be the best way to uncage your imaginary birds and bring back your creativity. I usually follow this trick for days. I search for the writing prompts everywhere, Google, Tumblr, and every possible platform. Then I sign up for the daily prompts. Once I finalize my writing prompt, I would start writing the first thing that struck to my mind after reading it and let my imagination play its role. You may not believe, but it works. Try talking to anything around. It could be your favorite soft toy, your pillow, your pet or even that chair you sit upon! This small exercise will help you find your focus again because none of these will criticize you for what you’re saying. Just explain what you’re really trying to write. Let it flow! You might be thinking, why I have written the name of this 1989 released movie? 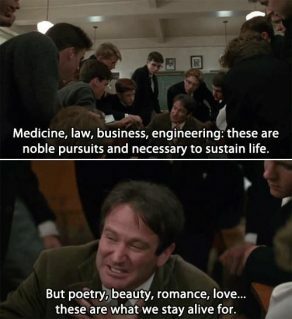 Every role and dialogue of Dead Poet’s Society will conspire to overcome your writer’s block. Yes! A movie can really help you in this crucial time. This movie is about an English Teacher who encourages his students to break the norms and live life on their rules. The way he reads out famous poets’ writings and his pedagogy will definitely inspire you to write. You will come through the great words of many great poets and authors who will help you in overcoming the writer’s block. Talking about poetry, you can also try our guide on writing a good poem which will help you to get those creative juices to flow again in your brain. Remember, you did a prank on your friend and everyone had an outburst of laughter? That vivid dream when you almost cried while sleeping? 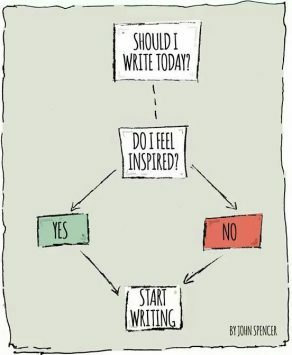 Yeah, these can be an outbreak from your writer’s block. To be a good writer one should know the art of storytelling. Start with writing about your fondest childhood memory or the fantasies you believed in. Write as if you are telling this to your friend. And then you can see yourself overcoming the writer’s block. You are the same as you were, just in a different phase. It’s not that you are not fit for writing anymore. Go and read those masterpieces that you have written earlier. See how easy you were with those words. How eloquent your writings used to be. Seek inspiration from your older self. You were great then and you are great now. Another way to get started with smooth writing schedules is to go monk style. Be disciplined like a monk. Schedule your mind to write at a particular time. Either make it a morning time as you are ready with your fresh ideas or night time when you had many feelings and experiences to write about. Every day when you will sit on your scheduled time, words will start flowing as fluently as ever. What if you rewrite the story of the book you like the most or a movie that you thought could have been better if written in some other way? An easier exercise you can perform during your writer’s block period is of reinventing the already existing piece of writings. You can also say it as reconceptualizing, where you will be writing about the other possible aspects of the story. This lets your mind to broaden its horizons and overcome the writer’s block. This might sound weird to you. But the fact is an average person’s vocabulary is last updated till his developing years. It is said that the more words we have in our vocabulary, more easily we can express. And, this can solve your problem of writer’s block. New words, new meanings, new emotions and this will generate a new writing piece. Now, coming that simple trick which will help you to get over writer’s block one hundred percent sure! Just put five arbitrary words on a piece of paper. Add five more words. Make a sentence. Be it anything. Make some sense out of it. Be a little creative. 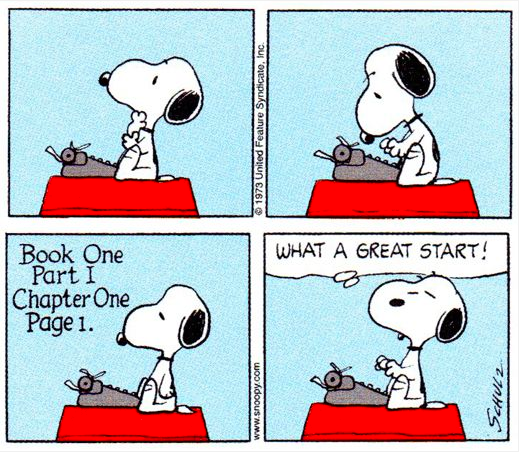 A writer’s block vanishes when you start making sentences, then paragraphs and then the whole chapters! Go for a stroll. This meaningless walk will give meanings to your words. Observe nature. See the color of leaves, the height of trees, the vastness of the sky and the flights of the birds. Watch people and try to peep into their lives (not literally). You will discover many stories and emotions about which you can write. 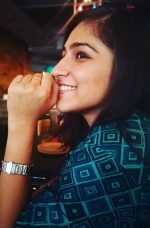 This technique will give new wings to your imagination and help you to get rid of writer’s block. Just shut down your computer! How about meeting your friends? Yes. I guess this can help you in carrying off that block. Share your pain, sorrows, frustration, and joy with them. Describe to them how struck you feel right now. Listen to their laughter, see the curves of their smile and feel their heart beating their bodies. This will elate your mood and you can easily catch up your writer self. Find the smallest part of your story you could finish the fastest and move things forward. Try to put your mind to it and get it done. It will take less time and give you a sense of achievement. And that sense of achievement will work as a carrot for a bunny to get your brain hungry for more. 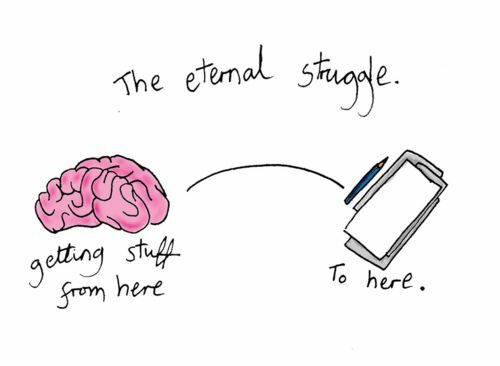 And once your brain gets working, it will surely lead you forward with your writing. Paint that ivory sheet with words. Spill out everything on it even if it does not make any sense. Not all people understand abstract. This is one of the best ways to overcome writer’s block. Write anything and everything. Write even if your brain resists. Spend 15 minutes or more at your desk doing freewriting. Writing randomly with grammar errors, no punctuations, change the subject if you feel like but just write. Enough of writing the way you are comfortable. Try adding some constraints. Say you can’t end sentences with words that begin with a vowel. Or you can’t have more than one word over eight letters in any line. This simple exercise will bring your mind to the challenge mode, increasing the consciousness by itself. Such limits also create focus and change your perspective towards what you are trying to write. And that, my friend, is what’s need to overcome writer’s block. It becomes more difficult when you think that you will always pour the magic of words. No, it does not work like that. You cannot always be perfect. Lower your expectations from yourself and don’t burden yourself with high expectations. Keep in mind that this is your first draft. You will get many chances to improvise until the final draft. Allow yourself to do mistakes and gradually make it perfect. I don’t know if writer’s block is a myth or it really does exist. It is also really difficult to say what causes writer’s block in first place; it could be your fear, your expectations or maybe the timing. 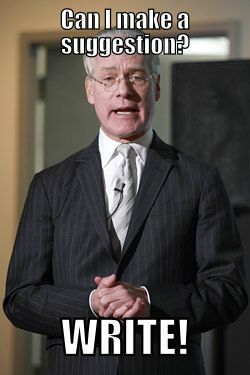 Whatsoever it is, certainly what I do know that it is paralyzing your writing passion or career. You surely need to conquer it. You can also try going to a bookstore to overcome the writer’s block. Reading books will lead you to a different world and eventually, you will be able to write different words. When JK Rowling was struggling through her writer’s block, the next thing the world knew was that 9 million copies of a book from Harry Potter’s series were sold in 24 hours. I am sure you will find your writer’s block cure in at least one of the tips that I have mentioned in this post. With persistent efforts, even rock is molded and this is just a block. I know and I believe that you can also do this. Have any Secret Tip? 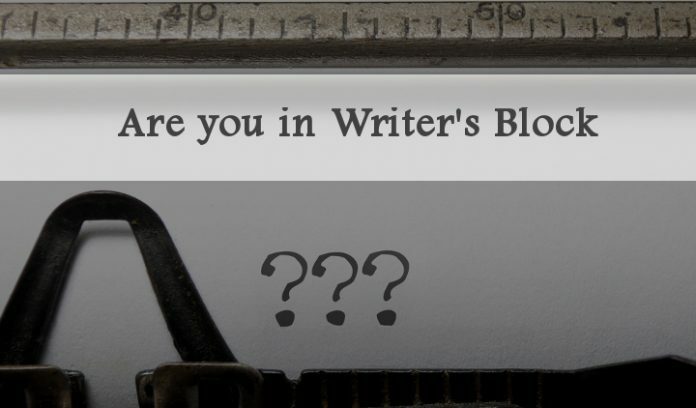 Tell us about your ways to overcome writer’s block in Comments below.